A demolition worker has discovered a postcard sent to JRR Tolkien's wife, behind a fireplace at the Lord Of The Rings author's former Dorset home. Stephen Malton made the discovery at the three-bedroom bungalow, in Lakeside Road, Poole, where Tolkien retired with his wife Edith in 1968. 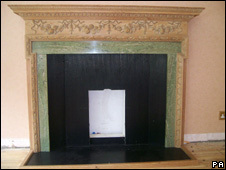 The fireplace is due to be salvaged before the property is demolished, and will be sold along with the postcard. A bronze fairy and stone gryphon found in the garden will also be auctioned. Mr Malton, 42, who owns Bournemouth-based ProDem Demolition, said: "You could have knocked me down with a feather. "To find something with the Tolkien name on it is quite amazing. "We have looked under the floors - if we find a Hobbit that will be the icing on the cake." The postcard is dated 1968 and addressed to the author's wife at the Miramar Hotel, Bournemouth, where the couple spent many holidays. It depicts a landscape in Cork, Ireland, and is signed "Lin", which Mr Malton believes to be fantasy author Lin Carter, who wrote A Look Behind The Lord Of The Rings, published a year later in 1969. The postcard reads: "I have been thinking of you a lot and hope everything has gone as well as could be expected in the most difficult circumstances." Tolkien moved to Oxford in 1972, after Edith died, and sold the Poole bungalow for £23,000 to Stephen Frankel, who put it on the market for £1m in 2006. Developers Cranbrook Homes (Southern) Ltd bought the property and secured planning permission to replace it with two four-bedroom family homes.